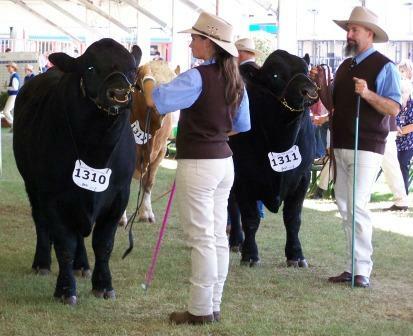 This year we have shown at our local Show Crookwell in February, Dubbo Beef Spectacular in March and Sydney Royal Easter Show in April. 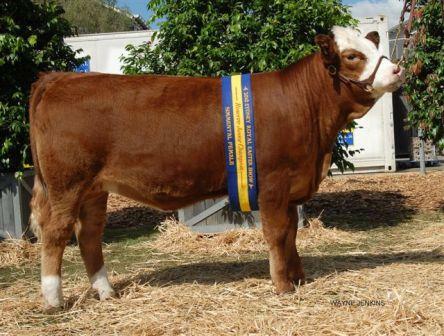 We are hoping to take a team to the World Simmental Congress which is happening as part of the Melbourne Royal Show in September this year. 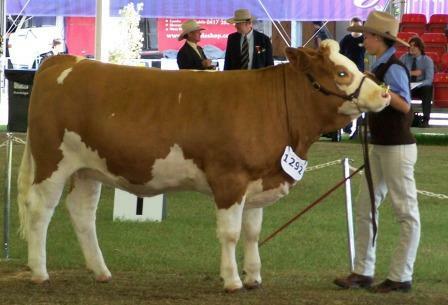 We had a very successful return to showing at this year’s Sydney Royal Easter Show. Our team of eight (plus a calf) proved to be a good selection. In the first class of judging female 9 & not over 12 months we had 2 heifers: Mala-Daki Rosanne E386 and Mala-Daki Nickey E392 both sired by Illawong Farm Brinkton. Rosanne placed 2nd in her class, with Nickey unplaced. Mala-Daki Lilibet D354 was our next entrant in female over 16 & not over 20 months. She is a daughter of Heywood Esquire out of one of our top cows sired by Zeuwald. Lilibet placed 3rd in this class. Next came the judging of Junior Champion Female. 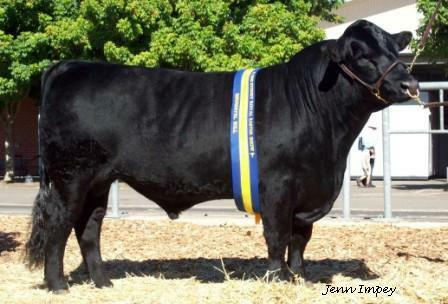 It was a lovely line up of Junior Females and the youngest female from Stuart Moeck’s Valley Creek Stud was the winner. 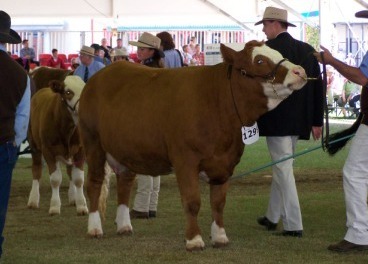 We were excited to have to take our heifer in and were overwhelmed with winning Reserve Junior Champion Female for 2010. In the female over 30 months Mala-Daki Ureaka A276, a 4 ½ year old cow with her second calf at foot, a 6 ½ month calf sired by Barana Emerald, was placed 4th in a very strong field of females. We had taken to ET sons of Hooks Majestic. These bulls came up against each other in the Bull, 16 & not over 20 month class. It was an exciting time to see our bulls take 1st (D364) and 3rd (D352) in a very strong class of junior bulls. Mala-Daki Crockett D377 was unplaced in the class but received a lot of attention for his outstanding muscle (he is an AI son of LBR Crockett). Junior Champion was the next class – we were up against our biggest rival, Lucky Clover Simmentals and their 9 month old calf ‘Flick’. Well, all three class winners were lined up and it was a delight to see Lucky Clover Flick win the title of Junior Champion Bull. To cap it all off, our bull Majestic D364 was awarded Reserve Junior Champion Bull. This was a fantastic achievement and we are thrilled as we have used this bull in herd with calves due from early July. We had the one entry in the Over 30 & not over 36 months class with Mala-Daki Agent C335. He weighed 968 kg with fat scan of 9/12 and an EMA of 129 cm2. 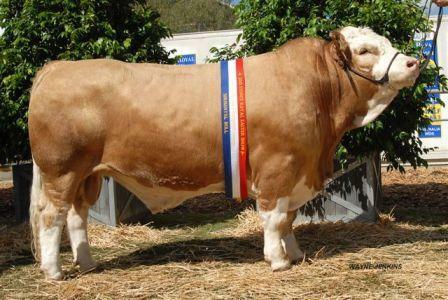 Agent went on to win Senior Champion Bull and then took the title of Grand Champion Bull against the Junior Champion Lucky Clover Flick. In the Two Bulls not over 24 months class we entered our ET Majestic brothers. We were the only entrant in this class however the bulls really stood out for their uniformity and similarity to win Champion Two Bulls. Mala-Daki Simmentals were awarded Most Successful Simmental Exhibitor and also Best Maintained Team over 5 head in the Simmental section. Congratulations to all Simmental Exhibitors on their success and special congratulations to Miss Jessica Lewis for her Supreme Exhibit. Thank you to the judge Mr Tom Baker, the RAS, all Stewards and of course all the spectators. It was great to have Mr Peter Speers on the microphone commentating the Simmental judging – sorry about the confusion with all the J Impey’s. A big thank you to Jessica and Jennifer Impey for so capably and carefully helping us prepare and show our cattle. Thanks also to Louie, Steve, Eric and Bruno for helping us prepare and have the cattle at the judging ring ready to go.